I’m a peace-loving man. Indeed I was kicked out of the Peace Corps for loving peace too much. Those phonies in the Peace Corps say they want peace, but I was the only one willing to fight for it. As part of my commitment to spreading peace I’m constantly studying the science of aggression, and did you know studies have shown people are more likely to fight and commit crimes at high temperatures? You might ignore a Disneyland line-cutter at 75 degrees but you threaten utter and complete destruction at 95. We like to think we’ve evolved a great deal as rational humans but in reality the only thing keeping the peace is the thermostat. I spent a few months in New York last summer. My first two months everyone was friendly and polite, and I kept thinking NY must be one of the safest cities in the world. But one day in August the temperature shot up to a muggy 93 and within two hours I saw a fight, I heard a fight, and I heard about a fight. Three fights. The next day the temperature dropped and the whole city returned to civility. The lesson is clear: Don’t send diplomats to the Middle East; send an air conditioner. There’s also some evidence that colder countries experience a higher incidence of depression and suicide. Based on what we know about hot and cold temperatures’ effect on the human psyche, I wonder if there’s an optimal temperature for giving someone bad news. Too hot and he’ll turn on you. Too cold and he’ll turn on himself. If you can get the thermostat just right, maybe he’ll have nowhere to turn. In 1945 Robert Sherman of Massachusetts invented a portable, in-window air conditioner that cooled, heated, humidified, dehumidified, and filtered the air. 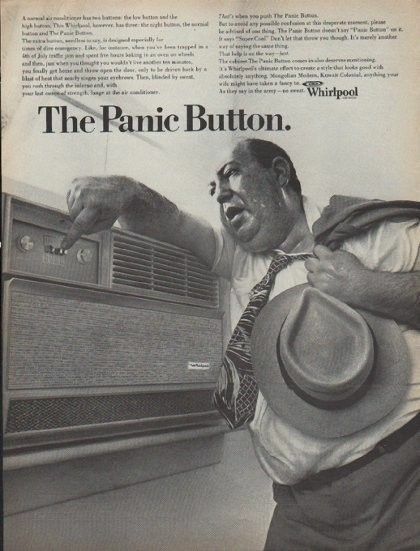 The year 1945 marked the beginning of cheap, consumer air-conditioning. That same year 1945 also marked the ending of the last world war. Coincidence? Yes. Probably. But still worth pondering. I don’t follow the news very closely but apparently there’s some sort of election going on, and of course many candidates have been asking for my endorsement. I’ve given it some thought, and I honestly believe we could do a lot worse than electing an air conditioner, history’s greatest peacemaker and the perfect counter candidate for anyone tired of hot air. 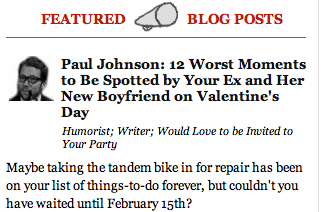 There’s always a lot of wisdom and brilliance masquerading as simple jokes in these posts, Paul. I can get behind your A/C 2016 campaign. Maybe I’ll even write it in and send you the photo. I realize a write-in candidacy is the only possibility at this late date but I say it’s A/C or nothing. Or perhaps even the threat of a write-in campaign would be enough to win VP consideration. I’ve always found it fascinating that mobs don’t congregate to loot stores and set cars on fire when it’s 13 degrees and snowing. Maybe all professional and college championship games should be played during a snow storm? That’s worth considering. It does seem I remember a lot more rioting after NBA championships–which take place in the summer–than football or baseball championships. I rioted after the Pats lost. Sure, it was just me drunk and looting my own fridge for more gin, but that counts. Don’t forget about the riots after the Stanley Cup – and it always seemed off to have an ice hockey championship played in warm weather. I would think ice hockey would be the sport you could count on to have the fewest fights. There’s quite a bit of group looting in the steaming oppressive heat/flooding after a hurricane…although some say they are only looking for AC for survival…odd they keep confusing big screen TVs with those. I think there’s a misguided belief that big screen TVs will be the new currency in the apocalypse but what good will that TV be if there’s nothing on? An AC unit will always be universal currency. I would vote for an air conditioner. Debates wouldn’t have to be bleeped because it’s already filtered. I think an A/C unit VP would be enough to win the muggy southern states. Excellent column! I second your nomination for A/C. We have too many politicians full of hot air running. It’s time for a change. If winning ‘everything’ includes the presidency I’ll take it. Unfortunately, in the US there is a requirement that a presidential candidate must be at least 35 years old, and I don’t think we could expect quality cooling from a 35+ year old A/C. Do those kinds of rules still apply to a write-in candidate? I mean, there’s probably a rule that the president has to be human too but I think we’re ready to overlook that. I can’t support a candidate that would lock me up and forbid me to open windows in the name of me keeping my cool. It’s another case of fear mongering being used to deprive me of my freedoms. It’s true the A/C unit might alienate some voters with the draconian requirements of keeping windows and doors closed. Less window and door freedom is a price I’m willing to pay for room temperature. Maybe we should all live in San Francisco. Isn’t it always cool there? I feel most of life’s problems can be solved be good weather. It’s hard to be unhappy at 75 degrees. You have solved my problem of having simply NO ONE I want to vote for….. You should have written this post earlier! Perhaps AC could have gotten on the ballot! Such brilliant reasoning! It’s not too late for a third party candidate. Well, you didn’t have to study the science of aggression for long to realize cold weather makes you depressed/suicidal. One visit to Maine and you’d know that fact instantly. The great thing is that cold weather also makes you lazy. So, we are really sad, but too tired to do anything about it but brood, so less suicides. Reminds me of the Dorothy Parker poem when she considers all the different forms of suicide and it all sounds like so much work that she decides she might as well live. just looked up that poem because I didn’t know who she was. Loved it, interesting woman. Most of the candidates (okay, all of them) seem full of hot air anyway. I like the idea of nominating any air conditioner anyone cares to choose. Hitachi (though, maybe not born in the U.S.), Samsung, or perhaps a Lennox and I’ll happily vote for them. Who wouldn’t want a president who knows how to keep their cool? I remember school in Miami in the 50’s and 60’s. The main office had AC but the rest of us just sweltered and dripped sweat on our papers and books. PE was a death march.